Blackberry. Sweet Orange. Yellow Grape. Honey. Such flavor notes “sing the Burundi song” for George Howell, who shared his passion for Burundi’s “Gitwe Hill” coffee at an event he hosted in April at the Boston Public Market. Everyone in specialty coffee respects George as a passionate purveyor of the world’s best coffees and the co-creator of the Cup of Excellence in 1999. Lately, he’s also been curating a series of East Coast events that feature his zeal for education. So far, his special guests have included Raul Perez, Mokhtar Alkhanshali, and Dr. Christopher Hendon. Most recently, George invited Ben Carlson to stop in Boston before the annual Global Specialty Coffee Expo in Seattle. During George’s introduction to an audience of 60 guests, he praised Ben and his wife Kristy Carlson as American coffee pioneers who started the Long Miles Coffee Project (LMCP) in Burundi in 2011. George smiled as he described his first taste of the Gitwe Hill micro-lot with enthusiasm and delight. The Gitwe Hill is one of nine hills; the project itself, Long Miles, is named after another. But, despite proximity, each hill possesses unique flavor profiles that express the concept of terroir in coffee that George initiated in the 1990s. Each hill also holds a story of a community, one reason why LMCP’s motto—“Coffee, People, Potential”—summarizes what’s possible when people share a vision for better quality coffee and a better quality of life. Despite Burundi’s rank as the world’s unhappiest country according to the United Nation’s annual “World Happiness Report,” the country resonates with magnificent beauty and resilient people. Ben felt drawn to both when he first visited in 2010. At that time, he and Kristy had been living in South Africa for nine years, after leaving their midwestern homes in Wisconsin and Minnesota, where Ben was working as a coffee trader and consultant. But he wanted to do more. His initial trip to Burundi fueled his dream of the potential for a different kind of life: that of coffee farmer and producer. After the government liberalized the coffee sector, Ben also imagined the potential for great coffee in a region that enjoyed perfect microclimates. Kristy agreed to take on the risks: to sell their home in South Africa and move with their two sons to Burundi; to buy land with the help of donations from friends; and to build a coffee washing station. This goal was both necessary and strategic, since in East Africa, the washing station is the pivotal place for impact. That’s where farmers bring their coffee cherries, hoping that the washing station manager will treat them fairly and pay them their due wages after the cherries are processed and prepared for export. In early 2013, the Carlson family took the leap. The end of that year brought their first harvest of coffee, which they managed with 400 families. The word spread quickly that the Long Miles Coffee Project treated farmers with equity and dignity—and paid higher wages. Now Ben and Kristy work with more than 5,000 families. It’s said in Burundi that there are two problems a day: one before lunch and one after. But a tiny stink bug has caused much more than that—destroying an estimated 40% of coffee cherries in Burundi and Rwanda. Pest sprays aren’t effective to kill the bug, so Ben and his team though of a creative solution: the Coffee Scouts. The job of these older teens is to hunt the antestia by spot spraying the coffee trees and collecting the fallen bugs by hand—all with the hope that eventually, Enemy Number One will be exterminated for good. Many women in rural Burundi have 10 children, so families often only have enough food to eat once a day. Since many young adults out of high school can’t find jobs, the Coffee Scouts proved to be a popular idea. In one year, the number of Scouts increased from 8 to 26. The Long Miles Coffee Project also created a summer camp to teach basic agronomy skills to teens, to provide meals, and to help pay for children’s school books. Now there’s more than forty Coffee Scouts, who have caught more than 40,000 antestia bugs in only three years. No doubt the work of the Coffee Scouts contributes to LMCP’s rising quality. In 2015, 4% of its volume scored between 88.5 and 88.9 points; in 2016, that percentage rose to 12%. These rising scores are extraordinary when we consider Burundi’s splintered history in coffee. German missionaries first brought coffee to Burundi and Rwanda around 1905, but it wasn’t until the 1970s that Burundi produced its first fully washed coffee. Since then, Burundi has entered specialty coffee markets in the U.S. and Europe to great acclaim. As a small landlocked country about the size of Vermont, Burundi depends on coffee (and tea) for approximately 90% of its Foreign Direct Investment dollars. Better quality coffee could bring economic empowerment to more than 600,000 small-holder coffee farmers who live in one of the world’s poorest countries. In 2016, Burundi exported 28 million pounds of coffee, but very little of that, perhaps only 1%, possessed a high enough score to be marketed as specialty coffee. This all links to ethnic wars and genocides of 1993 and 1994, where bloodshed affected the neighboring countries of Rwanda and Burundi. Looking back, many consider the death of both country’s Presidents—Juvenal Habyarimana and Cyprien Ntaryamira—when their plane was shot down by two missiles on April 6, 1994—as the spark that ignited the 100 days’ genocide against the Tutsi during the summer of 1994. This led to the loss of more than 800,000 Rwandan lives and ultimately more than 300,000 Burundian lives. Alongside the human suffering, the land cried out, too. The song of the coffee trees became muted for many years. Now in 2017, the song is returning. The Long Miles Coffee Project now has two washing stations: the Bukeye Washing Station in Muramvya and the Heza Washing Station in Kayanza. These serve as two beacons of hope for farmers who walk long miles for many hours to deliver their red, ripe coffee cherries. And if the only predictable thing about life in Burundi is that it’s unpredictable, one of the happiest surprises is the increased number of families who have joined LMCP: from the 400 families from season one, Ben and Kristy now work with some 5,000 families (upwards 24,000 people). Still, most of the challenges remain out of the Carlsons’ control, from fuel shortages to occasional grenades at night. Health care barely exists: a pregnant woman with complications might face a 2.5 hour walk to get treatment. Only two schools exist for hundreds of children in the 9 hills, a 23-mile radius. Infrastructure is weak: power exists only a few times a day, water only at night. 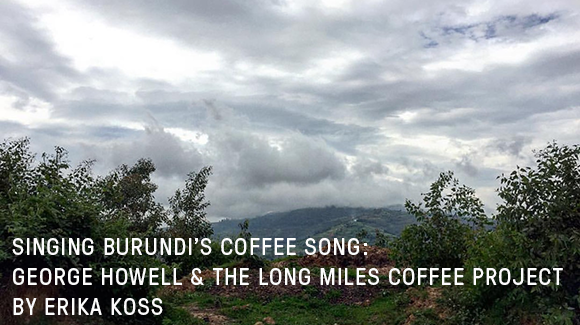 Through partnership with roasters like George Howell Coffee, the Long Miles Coffee Project promises to provide Boston’s coffee drinkers the chance join Burundi’s coffee song for many years, and miles, to come. For more information on Ben Carlson and The Long Miles project visit longmilescoffeeproject.com or follow him on Instagram @longmilesben.